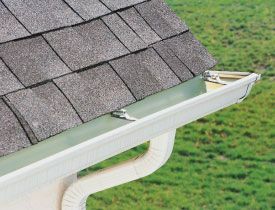 It may be hard to see the crucial role that eavestroughs play in directing water away from your home and preventing water damage. If your eavestroughs or downspouts are clogged, during a rainstorm you may see water falling in sheets from your roof over the front of your home. The damage this can do to wooden siding and landscaping will then be evident. The hidden damage of water that leaks into your home’s basement or foundations or the even more insidious damage of ice dam formation on your roof is often not visible until major structural damage has occurred. Rain seems to cascade directly off the edge of your roof. Your eavestroughs are sagging, gapping away from the fascia or cracked (especially at joints). You see birds or animals nesting in your eavestroughs. Black mildew or mould is apparent on the foundations. A trough or hole in your landscaping has formed where rainwater is pouring onto the ground from the roof.